This book starts with an 8-chapter course that teaches you how to use HTML5 and CSS3 to build websites. This course works for beginners as well as experienced web designers, and the last chapter teaches you how to use Responsive Web Design so your pages will look good and work right on any screen, from phone to tablet to desktop. When you complete this course, you will be able to develop web pages at a professional level. Then, you can go on to any other section or chapter in this book to learn new skills whenever you need them. Once you have a good grasp of how to develop web pages, you can understand today’s best practices for designing a site, as shown in chapter 18. Then, chapter 19 shows you not only how test and deploy your website, but also how to get the site indexed on the major search engines and directories. As we see it, mastering HTML5 and CSS3 will make any web developer at any level more effective. Most important is a new chapter on Responsive Web Design that presents all of the skills that you need for building responsive websites that will work on all screens, from phones to tablets to computers. This is the last chapter in section 1, and you’re likely to learn more from this one chapter than you can from complete books on the Responsive Web Design. Beyond that, though, every chapter in the book has been improved, enhanced, and upgraded. That’s why this book works better than ever in every way. Although you can use any text editor with this book, a text editor that includes syntax coloring, auto-completion, and error-marking will help you code more quickly and with fewer errors. In the book, we recommend Aptana Studio 3; however, it’s no longer supported and has become hard to install. If you combine our HTML5 and CSS3 book with its companion books, you’ll have the answers to all of your client-side development questions. “In 20-plus years of reading and writing software manuals, I've never seen anyone take as much care to teach one thing at a time as Boehm and Ruvalcaba do in Murach's HTML5 and CSS3 (3rd Edition). Their consistent pattern is a two-page spread: textbook prose on the left; code and annotation on the right. If a topic's too big to fit in two pages, they make it two topics. To give you an idea of how well this book works, you can download this chapter. It shows you how to use the CSS box model to control the spacing above, below, and on the sides of elements like headings, text, and images. This chapter also shows you how to use CSS to add borders or backgrounds to elements. That includes the CSS3 features that let you round the corners of borders, add shadows to borders, and provide gradients as backgrounds…without using the images that were required before CSS3. 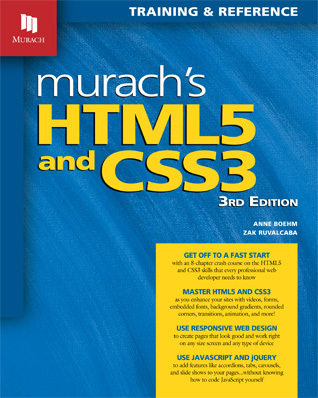 Murach’s HTML5 and CSS3 (3rd Edition) shows how to use Aptana as the text editor for developing HTML and CSS code. Unfortunately, Aptana is no longer supported and has become difficult to install. So our recommendation is to use Brackets instead. Developed by Adobe, Brackets is easy to install and use, has some excellent features, and runs on Windows, Mac OS, and Linux systems. So this tutorial shows you how to install and use it. Great book that fills in the gaps where other books leave holes. Section 1 (Chapters 1 through 8) set up a great HTML 5 foundation for web design. I gave four stars instead of five because the new edition still devotes almost a whole chapter on Aptana Studio, the recommended IDE for the book, though Aptana Studio is no www.brackets.io or Jetbrains Webstorm.